"As a former capital of Persia, the tradition of the Tabriz carpet is one of the oldest and most revered. Tabriz is a city with a rich culture and a strong history for producing master weavers. Known for their complex Mahi patterns, grand medallions and sophisticated colors, the Tabriz rug has been a constant market leader since the 1200s. A classic Tabriz carpet is often inspired by the music, religion, architecture, literary works and culture of Ancient Persia. Although a traditional Tabriz rug can feature many themes, they always represent the ultimate in craftsmanship and design. Some of the most popular styles in Tabriz Oriental Rugs are Tabriz Gonbad, Tabriz Mahi, and 50Raj Tabriz." The rugs manufactured in the city of Tabriz also are of great finesse. Their predominant colors are red, blue and ivory. They offer strong contrasts in the rug’s image but also inspire serenity and beauty. 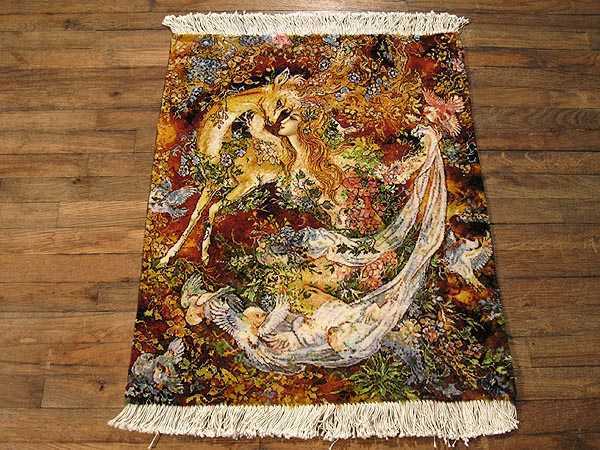 Most are hand-knotted on a soft cotton foundation using a combination of wool and silk. Some of them show the common floral designed central medallion. Featuring different sizes and a perfect symmetry these rugs prove the skills of those who worked to manufacture them.